The new GDPR regulations state that you must now add an unchecked opt-in checkbox to all your inline forms if you want to use the data in your mailing lists. In this article we show you how to customise the checkbox so the label and explanation are shown on every form across your website and your blog. You will be aware that all the contact forms on your website have the ability to collect and store your visitors' information in a database that then allows you to send out mailing lists. 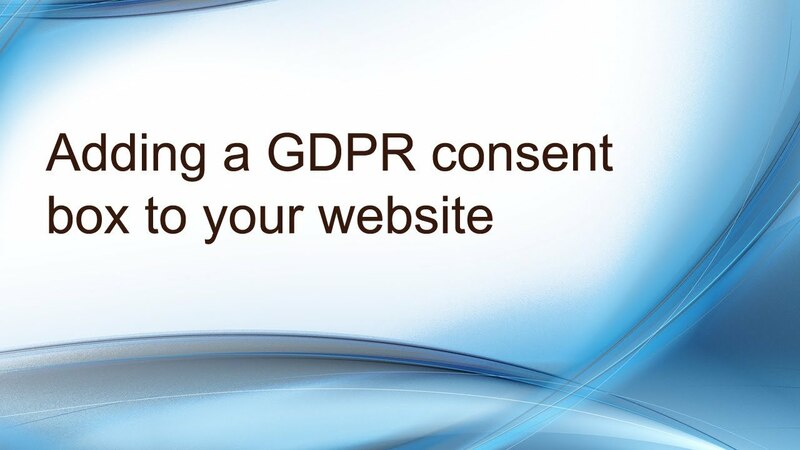 The new GDPR regulations state that you must NOW ask your customers for explicit consent. The good news is … we have already done this for you. Look at the forms on your website or your blog and you will see that a new consent box now appears with a little information dropdown. From now on, only if clients tick this box will your visitors' details appear in your mailing list. How do you customise this consent checkbox ? This is great – BUT what if you want to change the wording of the checkbox or the information box that appears on all the forms on your website ? Click the envelope icon on the top meny bar and then "GDPR consent box" and the GDPR tab in the contact Us configuration screen opens. Two input boxes are shown. One box changes the label and the other is the text that is shown in the information popover box. If you remove all custom text from either box, we will automatically add the default checkbox label and popOver information text.